This camping in Bangalore trip is perfect for a quick getaway from the city life and travel to a campsite in the midst of nature. Located just a short distance away from Bangalore, the campsite is placed around vast fields of towering trees and grasslands. Embark on short treks around the campsite and explore the scenic beauty that flourishes not too far away from the city. Try your hand at kayaking or swimming at the Hosa Kere Lake or participate in outdoors games like volleyball, badminton or cricket. If you wish to relax in your tents, entertain yourself with a game of carom, ludo or cards. At night, you can gather around a bonfire and have fun with your fellow campers. Have a delicious dinner and spend a night at this serene campsite. Located just 60 kms from Bangalore, this wonderful campsite lies in the folds of the SRS Hills on the shores of the shallow water Hosa Kere Lake. With it rich natural beauty of grasslands and hills along with the easy accessibility to Bangalore, it has become a popular camping destination for many adventure enthusiasts. You can go on treks around the campsite that will take you into the hills to explore local caves or take a dip into the nearby lake. Spend a night at the campsite and stay in cottages that come equipped with fans, beds and attached washrooms. 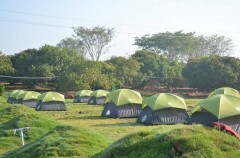 • Spend a night camping near Bangalore. • Participate in kayaking or swimming at the lake. • Go on short treks and participate in outdoor games. • Gather around a bonfire with music and have fun. 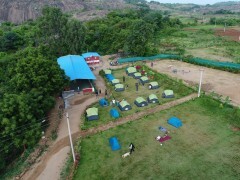 A basic level of health and fitness is required to book this camping trip in Bangalore. This is a non-strenuous activity. However, if you have any cardiac or respiratory conditions, or suffer from knee or spinal problems, please consult your doctor before booking this trip. Travellers are required to adhere to the instructions of the tour guide while undertaking any adventure activity during this camping trip in Bangalore. For cancellations made more than 10 days before check-in date of camping in Bangalore: 100% refund. For cancellations made between 7 to 10 days before check-in date of camping in Bangalore: 75% refund. For cancellations made between 3 to 6 days before check-in date of camping in Bangalore: 50% refund. For cancellations made less than 3 days before check-in date of camping in Bangalore: No refund. Please note that check-in time for the campsite is 16:00 hrs and check-out time for the campsite is 09:00 hrs. Day 1 of Camping in Bangalore: Check-in and enjoy! Arrive at the campsite by noon and check-in to your Swiss cottages. You can spend the rest of the day at leisure or indulging in adventure activities. Embark on a short trek around the campsite to explore local caves or try kayaking or swimming in the Hosa Kere lake. Within the campsite, you can also enjoy some outdoor games like cricket, volleyball, badminton or archery. There are several indoor games as well such as carom or cards. Once the sun sets in the evening, gather around a crackling bonfire with music. Post dinner, retreat back into your tents. Overnight at Ramanagra campsite in cottages. Enjoying a hike with friends. Wake up to a misty morning at the campsite and go out for a quick jog or morning walk. Depending on availability, you can also extend your stay at the campsite. Your trip ends here. 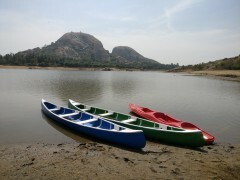 Kayaking along the Averahalli Lake. Overnight at Ramanagra campsite in tents. Check-in time at the campsite is 16:00 hrs. You will be accommodated in Swiss cottages on multi-sharing basis. The cottages are equipped with beds, fans, charging points and attached washrooms. 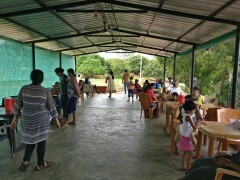 Today's meal package includes tea and snacks in the evening and dinner at night. Dinner is usually a combination of dishes such as chapati, curry, boiled eggs/egg curry, chicken curry, jeera rice/pulav, white rice, sambar/rasam/dal, curds and papad. Check-out time at the campsite is 09:00 hrs. No meals are provided today, but you may visit local restaurants or eateries to have breakfast at an additional cost. Bangalore is well-connected to most major cities of the country via flights to the Bangalore International Airport or trains to Bangalore Railway Station. You can hire private vehicles to drive down to the campsite, located 60-km away from Bangalore.